Jan has been in the home building industry for the past 32 years and has put over 900 families in new homes. With a business degree in marketing and a great personality, you will feel very comfortable dealing with Jan. A large number of Jan's sales have come from past customers who referred family and friends. They were happy with how they were treated and had enjoyable experiences building their new homes. Jan is knowledgeable in every aspect of building your home, both in design and on-site construction. Jan is also certified for ADA compliant housing. Jan is a hometown man born and raised here in Wisconsin Rapids, Wisconsin. He is proud to be a part of the community and enjoys spending time with his family which includes his wife Sara of 31 years, son Codi and daughter Kelsey. "They are my inspiration and motivation for my success in home sales." Jan is an avid bow hunter, ice fisherman and outdoor enthusiast. You can also find him cheering on the Green Bay Packers on Sunday afternoons. Jan is proud to be a part of the Golden Eagle sales team and often says, "You must believe in what you sell to successfully help people reach their dreams". It sounds like everything is under control and you have, as always, represented not only what I have expressed I wanted for this house's look to display, but also my best interests. I have developed a high level of confidence in you over these past months and I know that you are a professional at what you do. I have always relied on your opinion to steer me in the right direction when I wasn't sure of myself. My wife and I really appreciate your efforts in that area and in all that we've accomplished together up to this point. I have a future plaque I will be designing that lists all the important people, along with their affiliation, who were instrumental in playing a large role in making this project come to fruition. It will be displayed proudly at the front entrance of this home. It pleases us greatly to say that I have made room for your name on that honorary plaque. Keep up the great work that you take such pride in doing. Marc and I appreciate the time you took to talk with us by phone a week ago and the written, detailed, ball park estimate, you sent to us in the mail. We can see that you took considerable time reading over our lists of home characteristics and reviewing our house plan, in order to provide us with your expert and honest opinion regarding costs (ball park). Marc and I are now looking into finding a local log home builder (Nashville, Tennessee) and finalizing our thoughts regarding if we wish to purchase a "Shell Plus Package" or a "Complete Package" and how much work we want to do ourselves. We also plan to go to the Oct 9-11, 2015 Home Log and Timber Show in Chicago and we are enrolled in the "Log Home Building University" (Educational course). We hope this adds to rounding out our education regarding the process of log home building from a novice's perspective. We also are going back to Nashville, TN the first of November and are going to try and visit Bruce and Jayne Abshire's home if time permits. We would like to take this opportunity to express our "Thank you" for the great service we received during our building experience with Golden Eagle Log and Timber Homes. This was a dream of ours for many years. 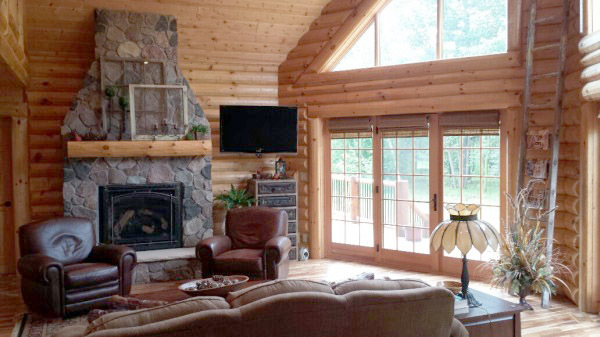 After careful research, meeting with numerous log home companies we felt Golden Eagle had the most to offer and gave us the confidence that we would be treated fairly. 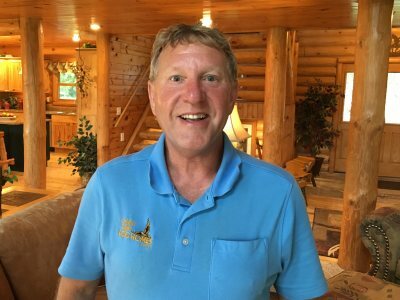 We met Jan Halbur at a home show in Madison and he has been a blessing to work with, He is a true professional and a great representative of Golden Eagle Log and Timber Homes. Jan introduced us to Coffen Construction who worked with us to build our new log home. 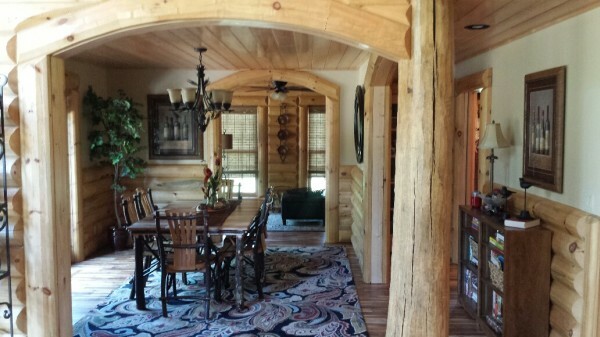 Living in our new log home has given us such enjoyment which we expect for many years. 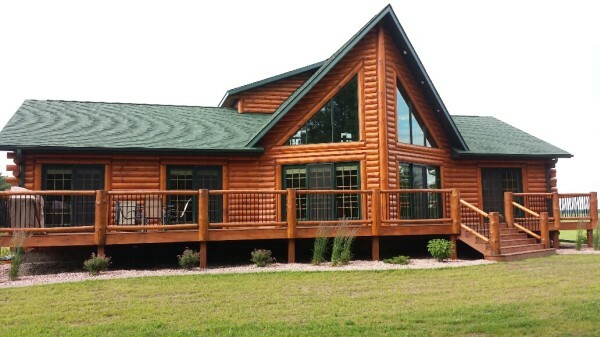 Our entire process has been a great experience and we welcome anyone interested in building a new log home to tour ours if they are ever in the area. We appreciate the professionalism of the entire Golden Eagle Team. I am settled at last in my wonderful new log home. I wanted to write you to tell you and the others involved at Golden Eagle Log and Timber Homes how much I appreciate their fine efforts in every aspect of building this home. Jan, you especially are to be commended from the very start-beginning with our first visit to Wisconsin Rapids through the final delivery of the materials you were patient and efficient. You did an excellent job in guiding me through the important choices. I also appreciate your sensitivity concerning my budget. Derrick Schultz was also helpful and prompt in changes made after the construction began. There is not one thing i would change. The layout works wonderfully well for me as I am settling in. This little home lacks nothing and I am enjoying it so much! The building process, which many times proves a headache, also went well. Everything Nationwide needed was here and available when it was needed. I am also very grateful to my daughter and her husband for overseeing the project and catching any problems in time to be corrected. Please come and see the completed log home. 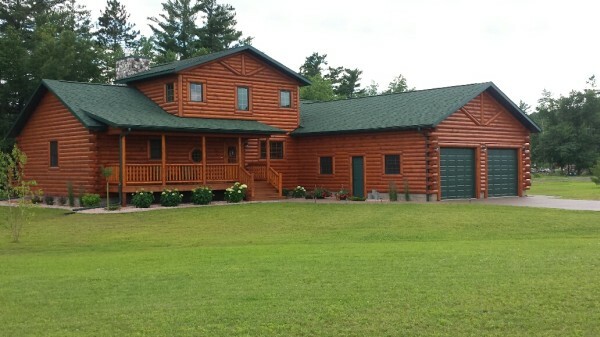 Golden Eagle Log and Timber Homes can be very proud of the finished project. As the holidays approach we want to take time to thank you for helping make our dream a reality. Our house is nearly complete, and we are enjoying living in the house we have planned and dreamed about for over 20 years. Your helpful ideas, excellent workmanship, and thoughtful consideration to our concepts have turned our house into a beautiful home. In so many ways, it has exceeded our expectations, and we can't think of anything we would have done differently. In appreciation for all you have done, we will be having an open house in the spring for everyone who worked on the house. Until then, please accept this gift certificate for a free night's stay at our Serenity Valley B & B. You may use it yourself, or feel free to give it to a friend or family member. Thanks again - and may you and your family enjoy blessings this Holiday season! Maya and I just wanted to let you know how great our home in Winchester, Wisconsin turned out. We appreciate all the time you spent with us from the first meeting through all the planning stages. You were very helpful assisting us and making sure our idea's were translated into reality. It was a pleasure dealing with Golden Eagle Log and Timber Homes sales staff and we have recommended them to several of our friends. Kathy and I would to share you a few pictures of our home and give you and Golden Eagle a big thank you. Jan, we really enjoyed working with you throughout the project. We appreciated your enthusiasm and attention to all of the detail that made our house such a beautiful home. 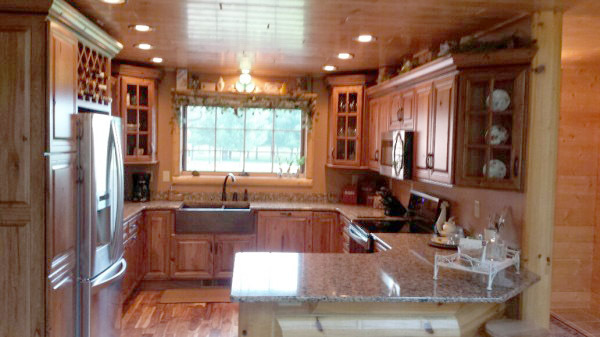 Derrick created a kitchen design that is so workable and we just love it. If there was any additional building supply needs or changes to be made, John was always there for us and ready to help. We also appreciated that the owners of Golden Eagle showed a personal interest in our home during the design and build. Golden Eagle showed us in so many ways how they truly care about their customers and their satisfaction with their products.